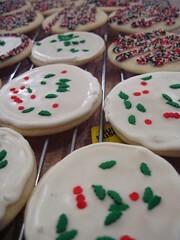 One thing that I just don't have the patience for is iced sugar cookies. I like the idea of them, of course, I love to eat them, and I also enjoy looking at pictures of perfectly iced holiday cookies in books and magazines, but when it comes to actually doing the work? Blaaah. 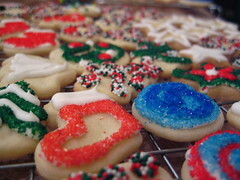 As near as I can figure, the reason I can spend time making beautifully iced cakes and cupcakes, and want to stick a fork in my eye around 45 minutes into icing sugar cookies is due to a question of volume. There are just waaaaay too many cookies to ice. Even a dozen is too many. 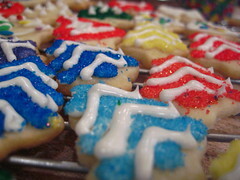 Unfortunately, I like the look of colorful sugar cookies in a holiday selection. 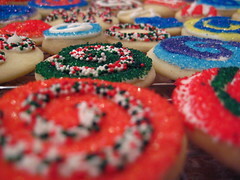 So what ends up happening is I bake a buttload of sugar cookies, dutifully take down the thousands of colored sugars and decors that I keep for the cookie icing occasion, and round about 5 cookies in, I just start slapping icing on them and dipping them in glitter sugar. Color! Color! Color! It's like clubbing with drag queens, the motto is: Shiny, darlin', Shiny! ... but that's about as fancy as I get. Sadly, even here you can see where I ran out of patience and just started doing the squiggle then dip. AND I NEVER LEARN! Even now, as I type this, there is a ball of gingerbread dough sitting in the fridge, just waiting to become gingerbread men and women. Colorful, faceless, LSD inspired gingerbread men and women to dance with during the space jam.